It’s been great to do this project at the Stove. If I’ve published in triplicate by accident, sorry + sorry + sorry… do let me know how not to! Coinciding with the COP21 Climate Talks in Paris, The Stove’s exhibition Submerge has brought issues of climate change into the heart of Dumfries. With Nadiah Rosli, I have brought together two considerations of peatland – from the Solway and South East Asia. The work also celebrates the form and function of bog-moss. With the dream of seeing restored peatland across Southern Scotland, I have become interested in how that curious and unique plant, Sphagnum, can be regenerated. 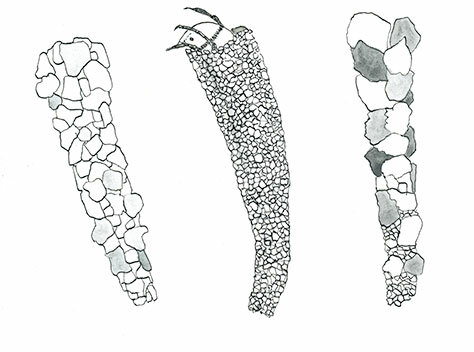 Very few complete Mosses survive – for example only 15% of Lochar Moss by Dumfries remained as moss by 1973, compared to its extent in 1889 (source – Peter Norman, The Great Moss). Until recently Mosses have not been valued for their ‘ecosystem services’ but peatbogs are the most effective carbon sinks known. 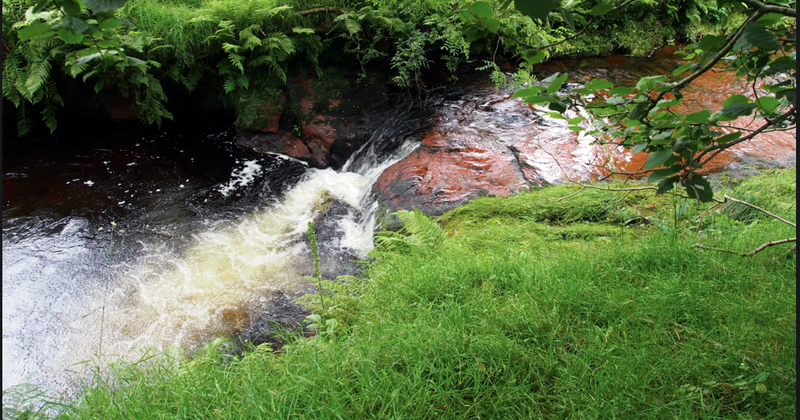 Conversely, peat releases greenhouse gases when it is exposed. Damaged Scottish peatlands are being restored using public money for climate mitigation – but at the same time, peat extraction is pursued privately. I see this, passing by on the A75 to Carlisle. For me, this grim landscape of carbon emission is a glimpse from the car window. Nadiah Rosli’s has had to breathe far more damaging airs – the thick toxic haze from fires raging in Indonesian carbon-rich peatlands. These affect countries in South East Asia, including Nadiah’s home country of Malaysia. This year is one of the worst years on record, and it has become a strange annual ritual for Nadiah’s family and friends to wear face masks and to stay indoors when the air pollution is particularly bad. The scale of this smoky haze can be seen from space, and huge carbon emissions result. It remains to be seen if the UN talks in Paris can require the Indonesian government to take action against this illegal burning of forest, that makes space for plantation monoculture. Friends of the Earth International believe Indonesian fires to be one of the most pressing climate change issues. At Paris, they are calling on the EU and US governments to introduce and implement strong and binding laws in order to stop the fires. You can read the report here, describing how EU shareholders are profiting. Setting out extracts of these investigations next to each other has posed questions of scale, and thoughts about the comforts and discomforts of distance (in both space and time). In relatively short periods ecological damage to slowly formed natural heritage can become ‘normal’. Nadiah, now a University of Glasgow postgraduate student of Environment, Culture and Communication, explains why she urgently wants us to know about ‘extraordinary injuries … committed through deliberate acts’. Her experience takes us into the emotional space of people for whom “Haze” has become an everyday weather condition, that can kill. Images of children in face masks at school compare with instagrams rejoicing at the sight of blue sky. There are also impacts on wildlife – a third of the worlds orang-utan population has been smothered, ancient rainforests wither in the heat, and skies are silenced of birds. These scenes of devastation are hard to imagine, and difficult to hold in mind when set alongside a Scottish peat cut for the hearth. Yet in combination, desiccation and fire becomes a disturbing theme amidst the watery concerns of Submerge. To return to Sphagnum, this moss is a kind of aqueous superhero which allows bogs to soak up flood water and release it slowly. Sphagnum has spongy cells, so dried-out strands can be submerged to absorb perhaps 20 times their own weight of water. Another statistic: a peat bog is perhaps 98% water and 2% moss. I am rapidly becoming an enthusiast for this rootless plant that survives only in dense upright mats and collectively creates peatlands. Author meansealevelPosted on November 24, 2015 January 21, 2016 Categories flux chamberLeave a comment on for the love of … Sphagnum! 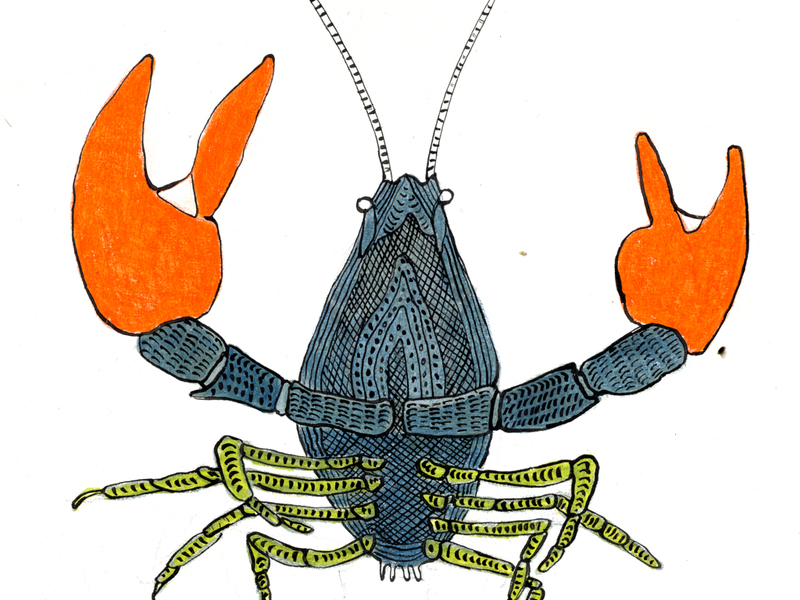 This pecha kucha was given at July Green Tease run by Creative Carbon in Glasgow School of Art. 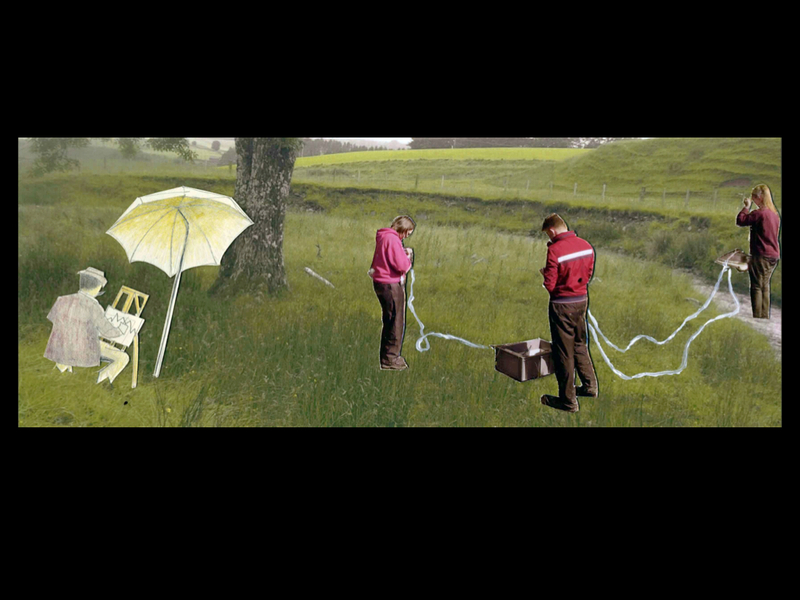 Flux Chamber is a multidisciplinary project which is finding ways to see Carbon Landscapes. 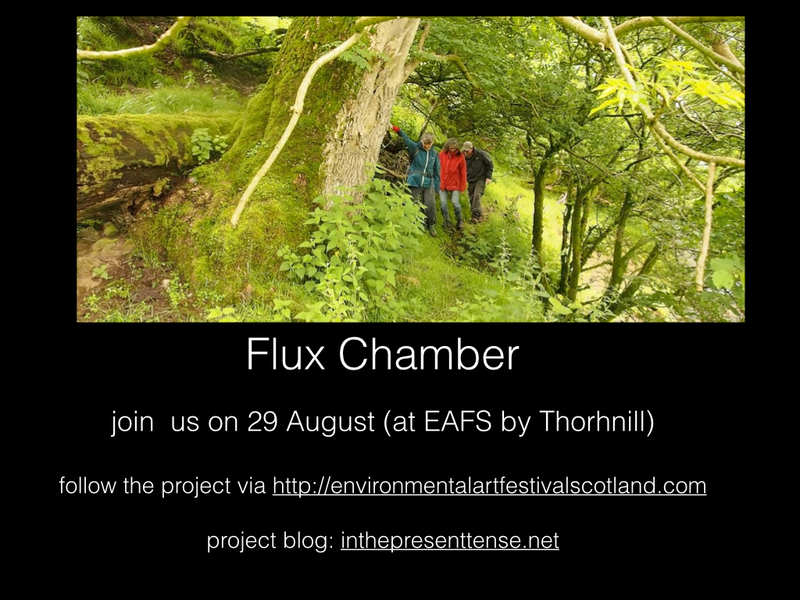 We are preparing an event for the Environmental Art Festival of Scotland on Saturday August 29th. I am working on this with biogeochemist (Professor Susan Waldron) and a teacher of environmental literature (Dr David Borthwick) from the University of Glasgow. 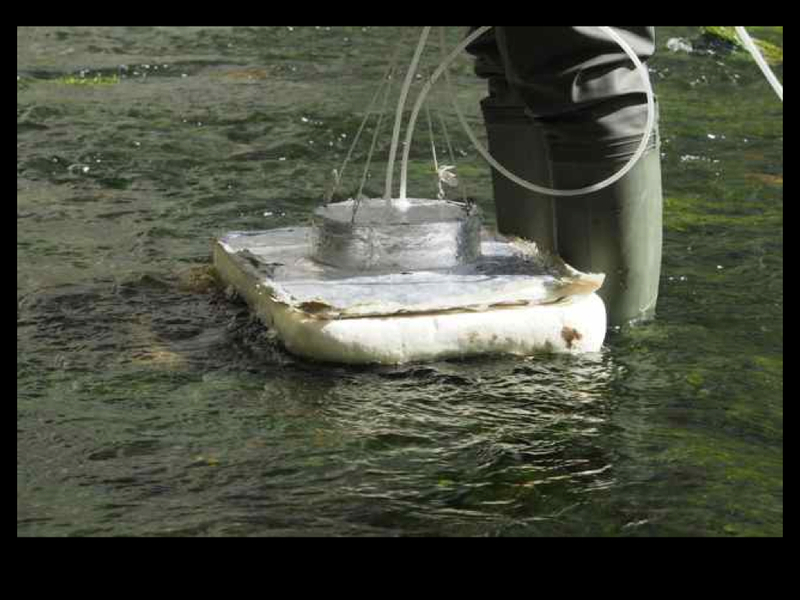 A Flux Chamber is also the name of a biogeochemist’s tool that shows exchanges of gas and energy as a river flows. Susan assesses scientifically how much carbon dioxide a river releases in different conditions. 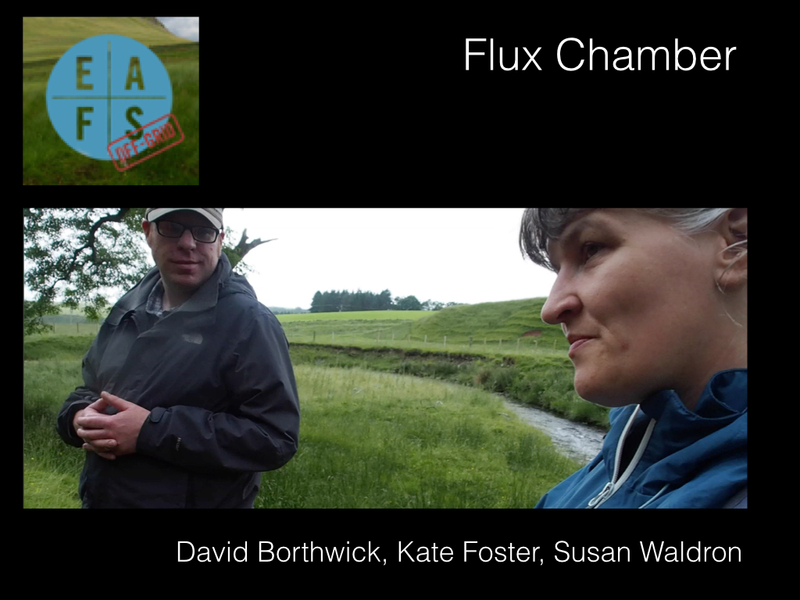 We will put a Flux Chamber to work to look at Carbon Landscapes in rural Dumfrieshire. 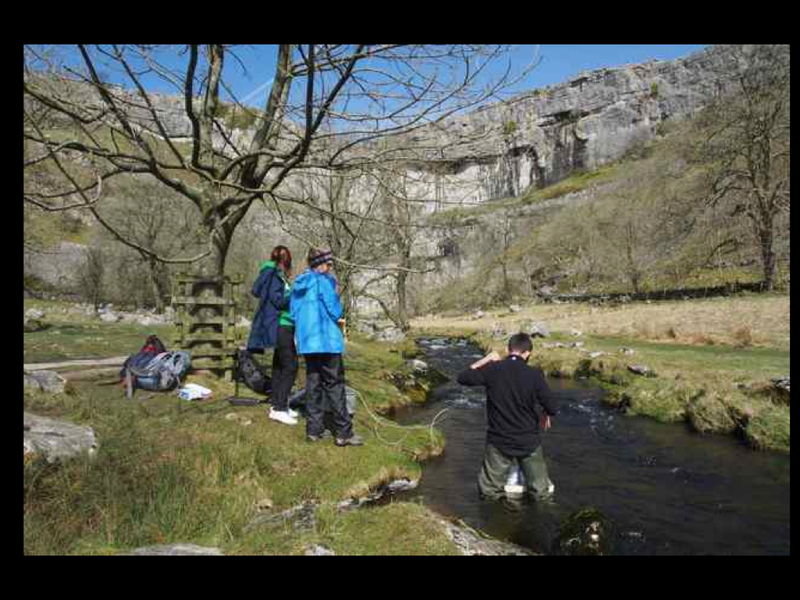 In April, I joined a field trip where Susan Waldron taught undergraduates how to use a Flux Chamber, in a river flowing out of carbon rich limestone at Malham Tarn. This is a classic Carbon Landscape where the carbon-loaded river degasses into the atmosphere. Despite the enjoyment of paddling in a river on a sunny day, I was taken aback to find that the atmospheric baseline reading was up to 400 ppm. 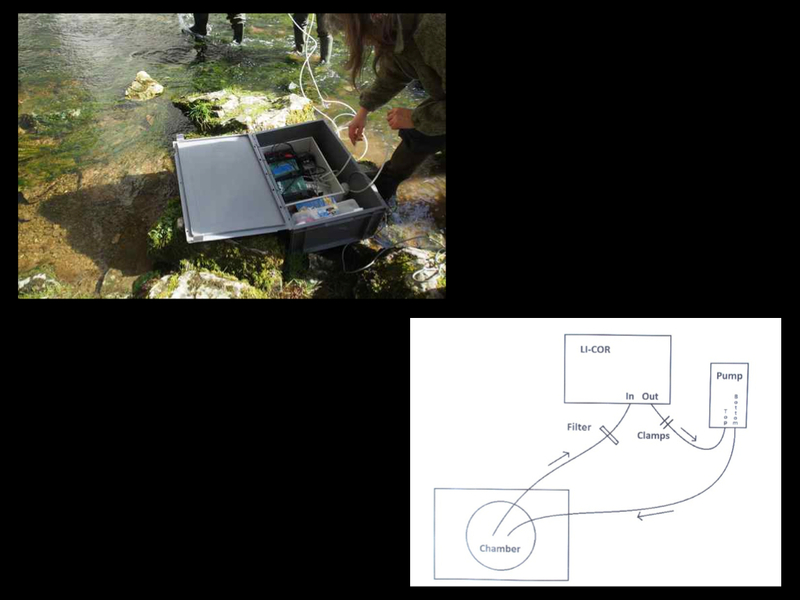 The students interpreted what they found in relation to river velocity and Ph readings, and found the CO2 levels on the surface of the river near the cliffs were much higher than the atmosphere – the river was shedding carbon. 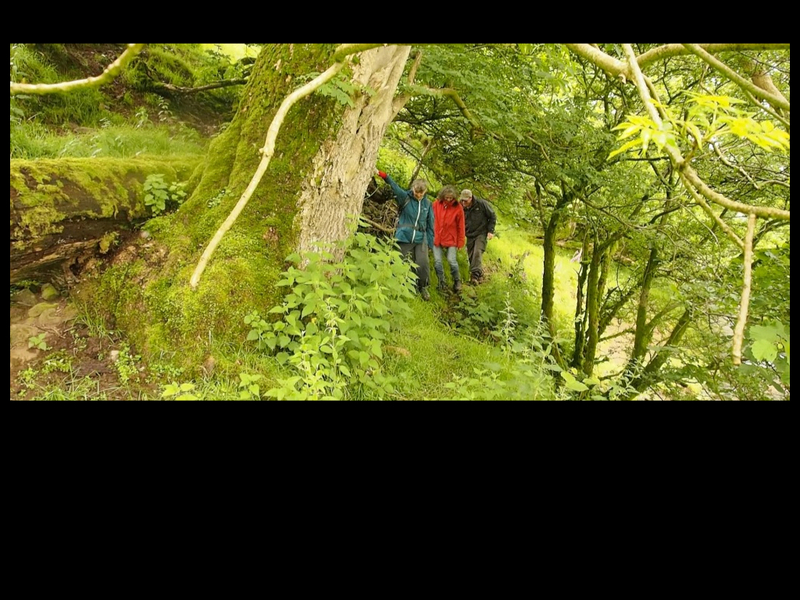 Below, you see the spot we have chosen as a Demonstration Site on our riverside walk (Cample Cleuch, near Thornhill). 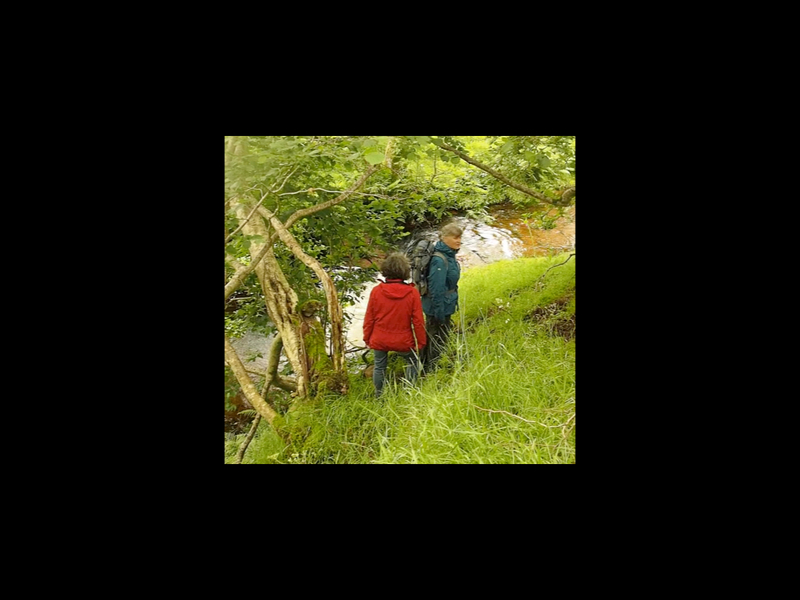 We will take measurements – and as you see, the scene will be documented by a plein air artist. I plan to graph the Flux Chamber readings (I will need to take an easel and an umbrella). 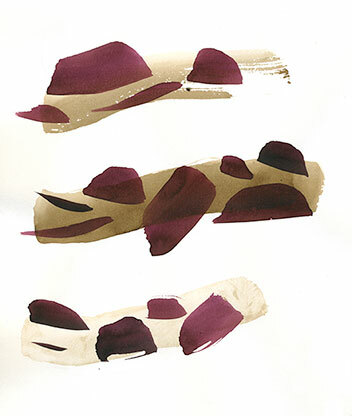 An artist of carbon landscapes, I learn, must become interested in river meanders and armoured banks. 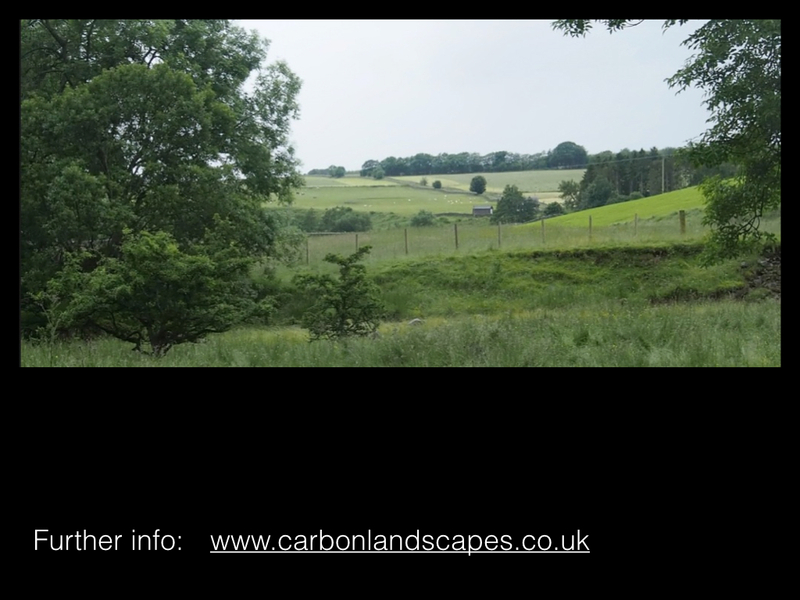 It seems that you have to think about Carbon Landscapes before you see them. There is nothing new about these processes, but if people are to protect naturally stored carbon, we need to develop sensibility to see how carbon is gained, lost and recycled. 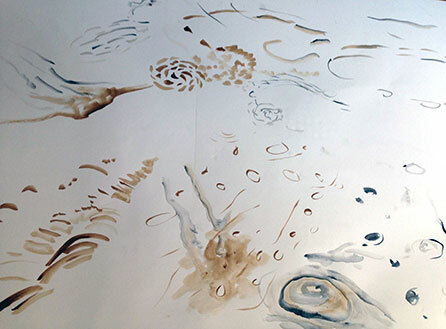 I use drawing to think through flows of carbon between different reservoirs – marine, terrestrial, atmospheric. I begin to understand Susan’s fascination with the influences on the release of carbon into the atmosphere – which has daily and seasonal patterns as well as human impacts. 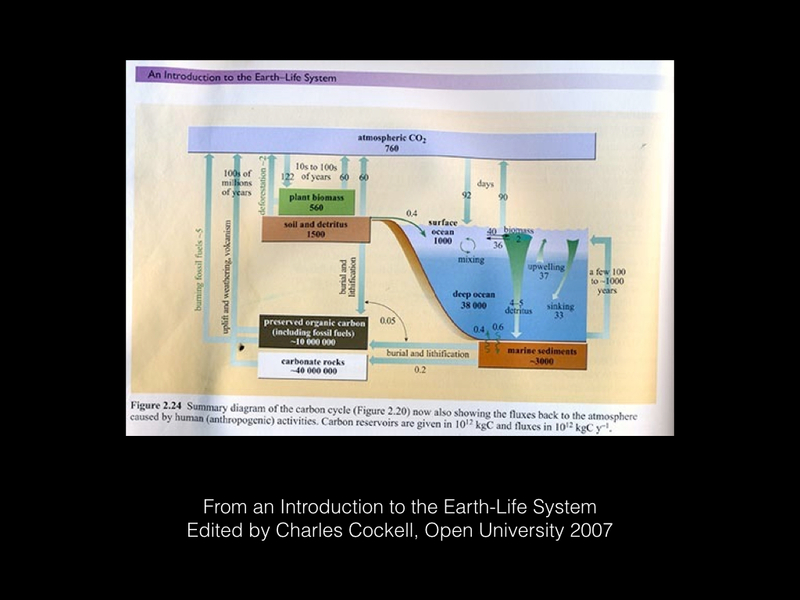 The way that humans use land influences how much carbon the river carries, or how much is sequestered. 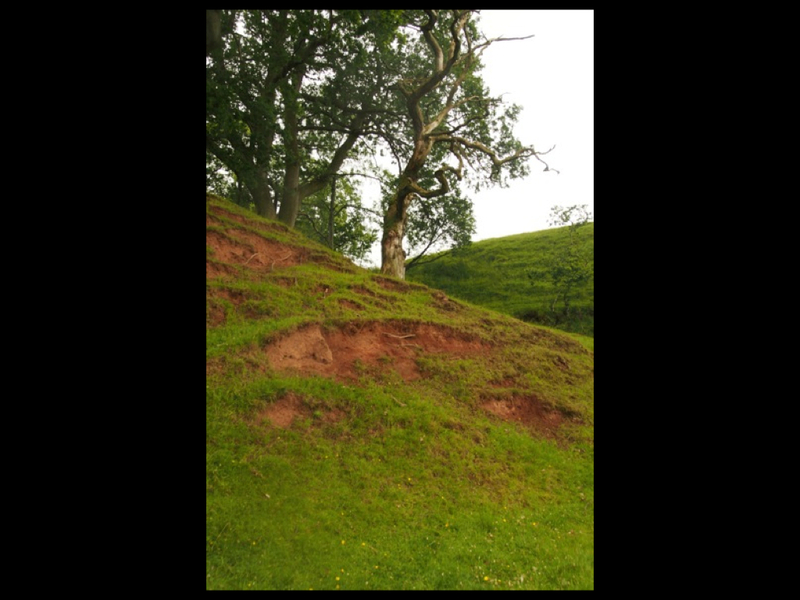 To a biogeochemist, this landscape at Morton Castle is a register of seasonal tree growth, biomass of silage, and the transformation of carbon between different kinds of life-forms. We did a preparatory walk on site last week. 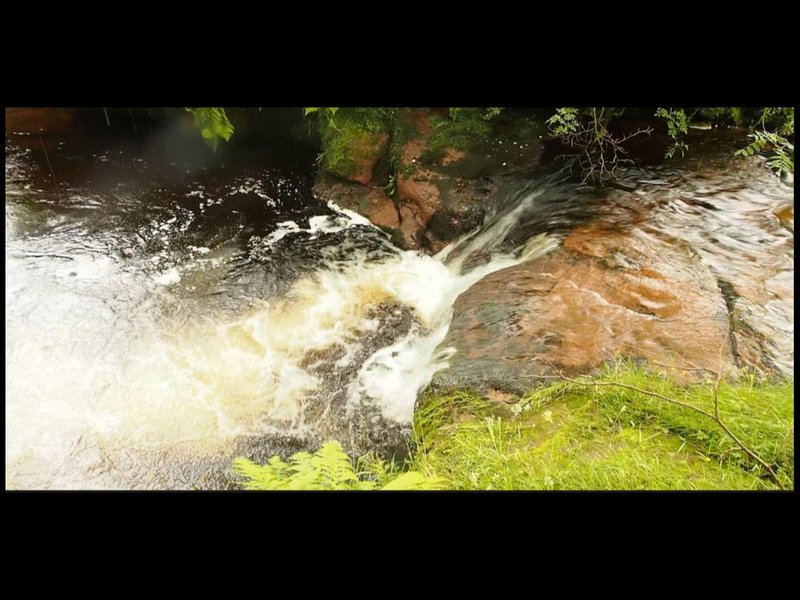 As a visual artist, I am focussing on how carbon landscapes can be seen, and David Borthwick is applying expertise about how poets work with such themes, and Claire Pençak – a choreographer – joined us in thinking how to move along a riverbank and sense how carbon moves through water. 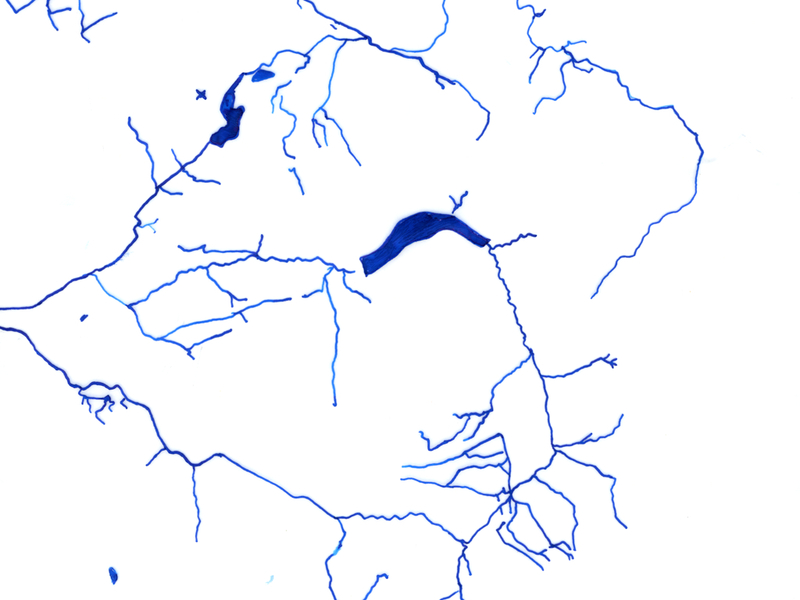 A catchment map of Morton shows Cample Cleuch running from the reservoir (in the centre of the image). The blue lines on the map are places where, we learned, efflux of carbon into the atmosphere is constantly taking place. In other part of the map, there might be carbon gain as well as loss. On site, we learned that the more sound a river makes, the more carbon it is losing. In other words, turbulent waters release carbon dioxide much more readily than smooth waters. This gives an additional meaning to the cascades of a waterfall. 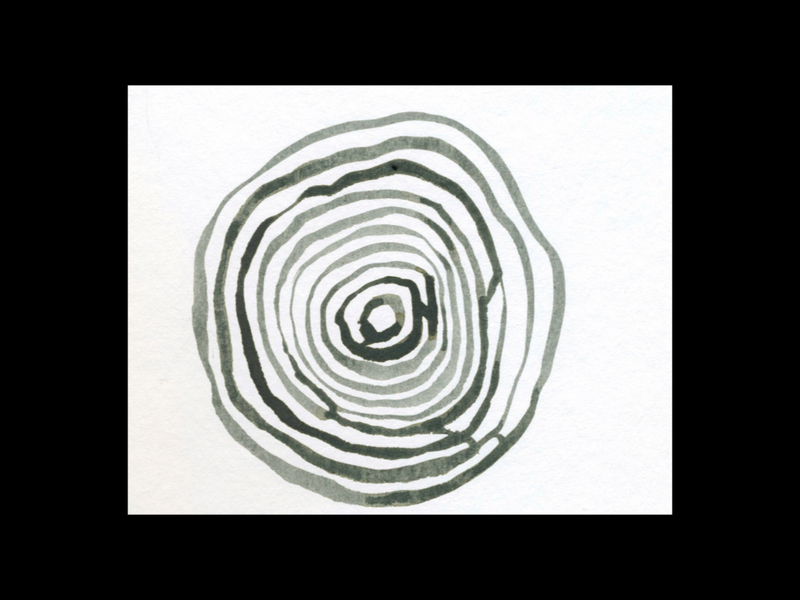 These additional meanings (which are available via our senses) are what Susan considers to be ‘auras’ of carbon landscapes. 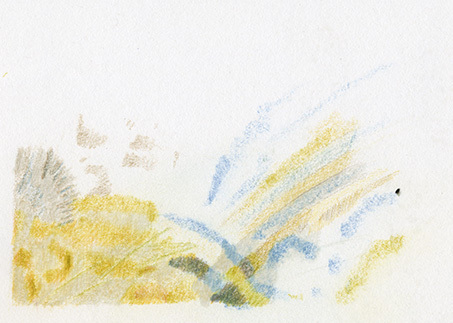 Another ‘aura’ is conveyed by water colour, indicating the amount of organic carbon within river water. 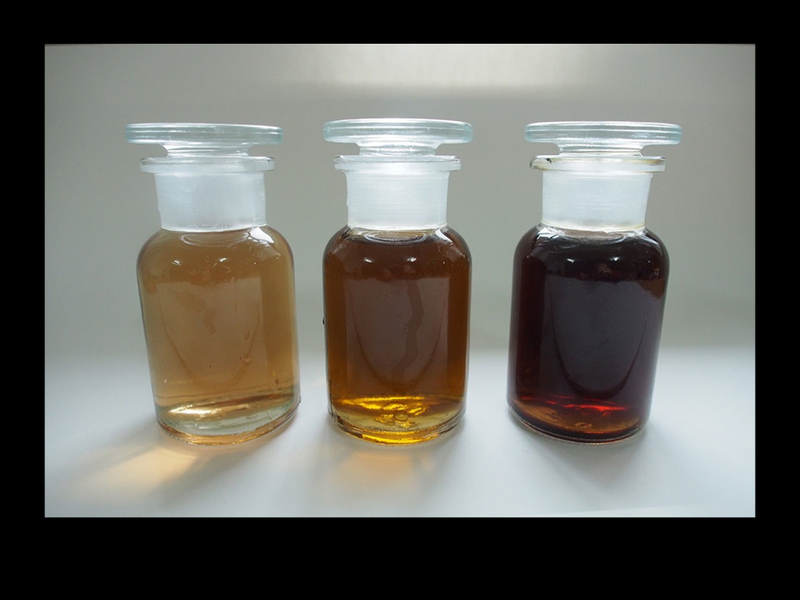 (These samples are in pigment jars from Cornellissen Fine Art Supplies). Soil erosion is something our new Carbon Landscape school must bear in mind! 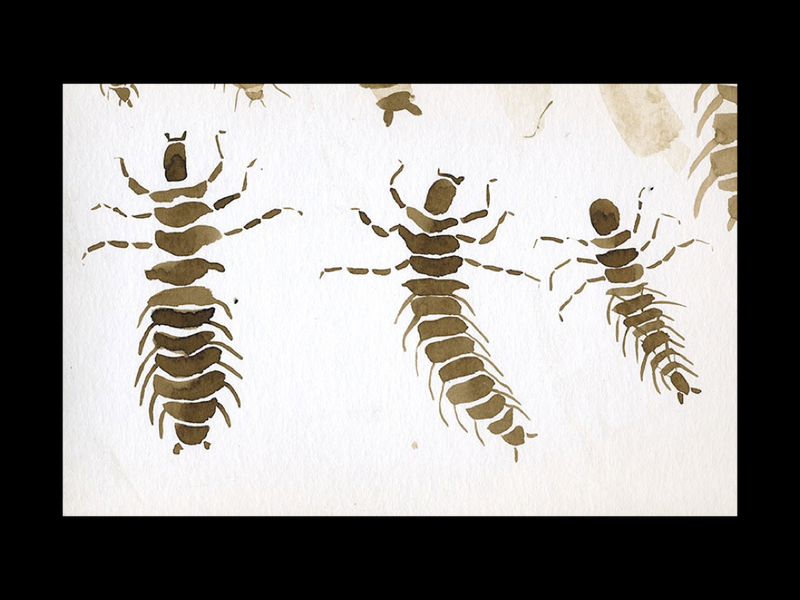 Not just a source of pigment and vivid coloration – think of the carbon leaching from this exposed site, the activity of microorganisms, and the prevention of sequestration. 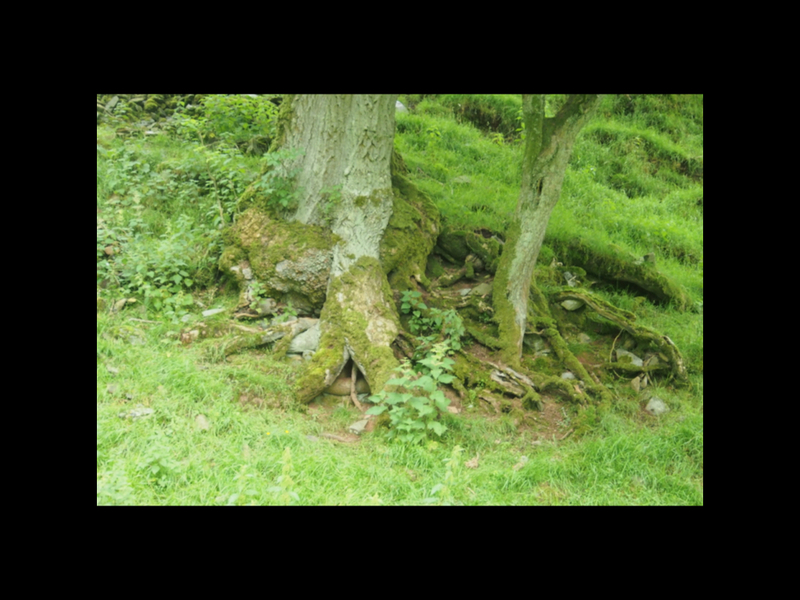 Within the grand sweep of global carbon cycling, microclimates can be studied such as how moss favours wetter sites, and how trees bend in relation to soil composition. Different meanings of the idea of ‘scores’ came up on our preparatory walk. Claire, a choreographer, suggested a score as a possibility of shaping movement along the riverbank. Meantime to Susan, a biogeochemist, this idea of ‘scores’ evoked possibilities of rating and measuring carbon flow. 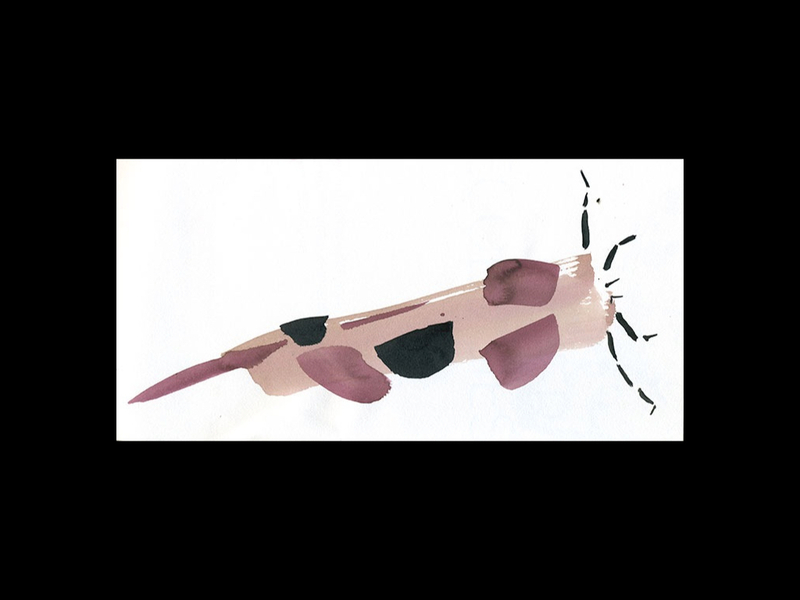 For me, other creatures are a proxy to understand why the details of gas exchange are important (see earlier post). 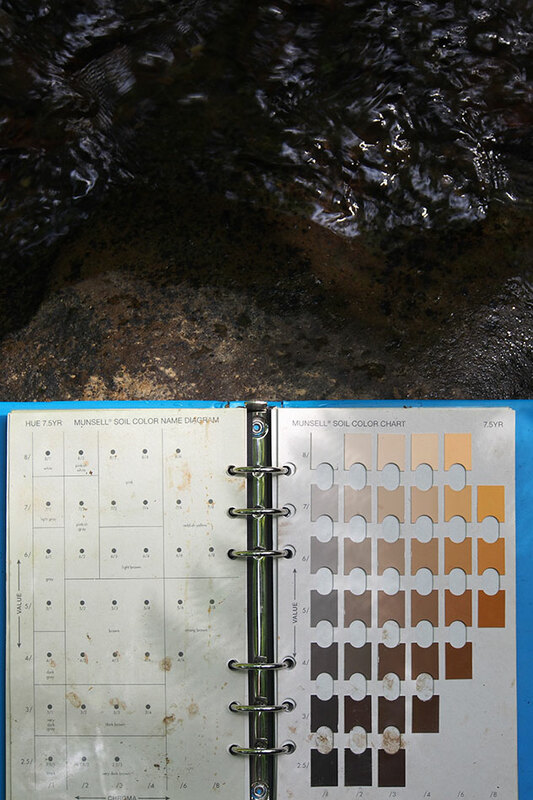 On a walk near Selkirk I found caddisflies, entomological indicators of pure water. 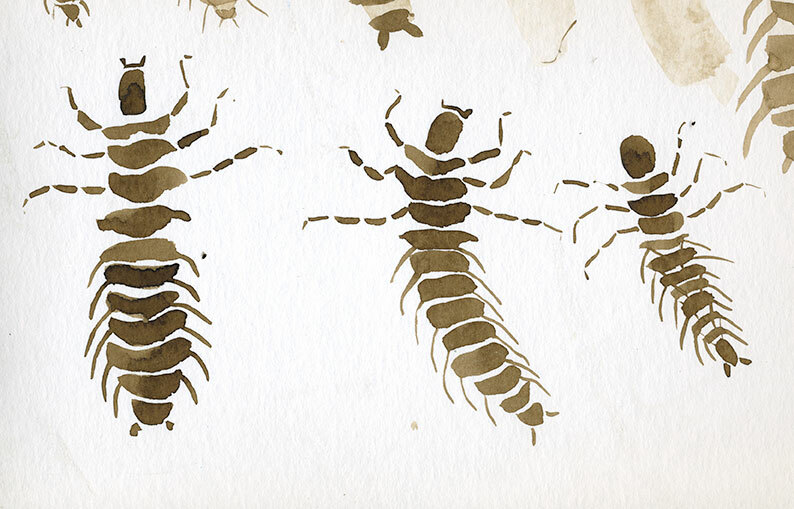 I watched them in their larval cases move slowly across the river stones. 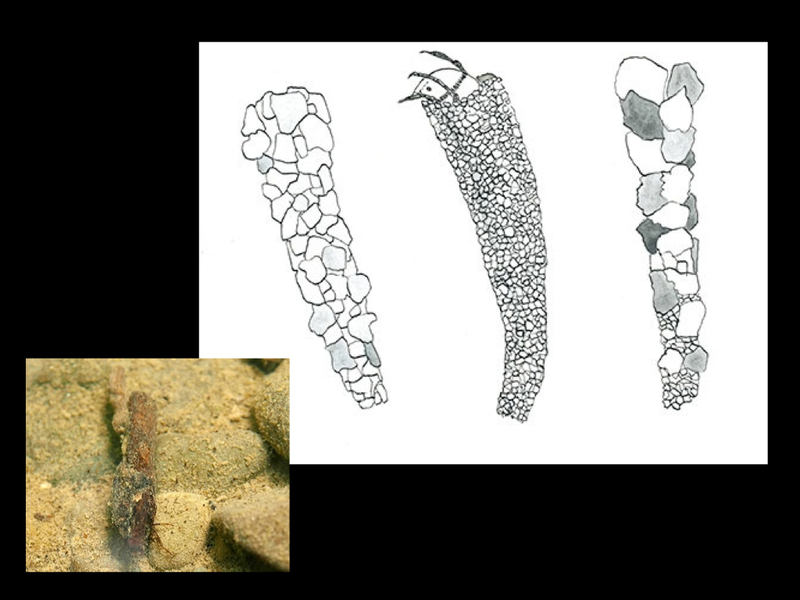 My photo sits next to a textbook illustration of varied larval cases. 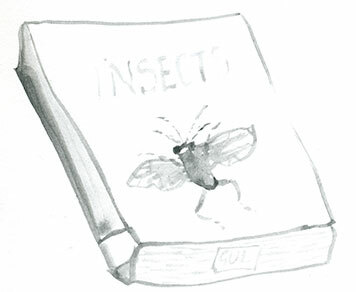 Each insect stage and species has a different means of wresting oxygen from the air. 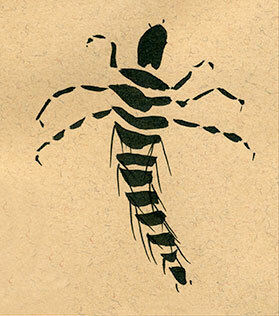 Aquatic insects depend on a variety of elaborately evolved body parts to breathe, and conditions can be unfavourable, such as heat, stagnation, poor aeration. 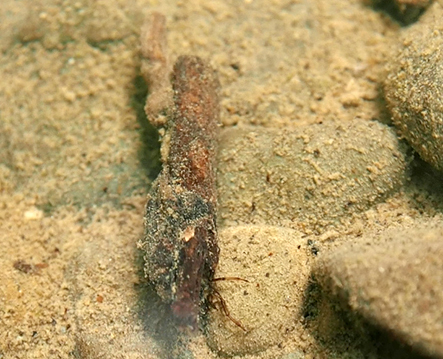 I learned that inside their larval cases, this species of caddisfly waft water over their several tufts of finger like gills. The cases use found materials – wood in this instance – bound with silk. 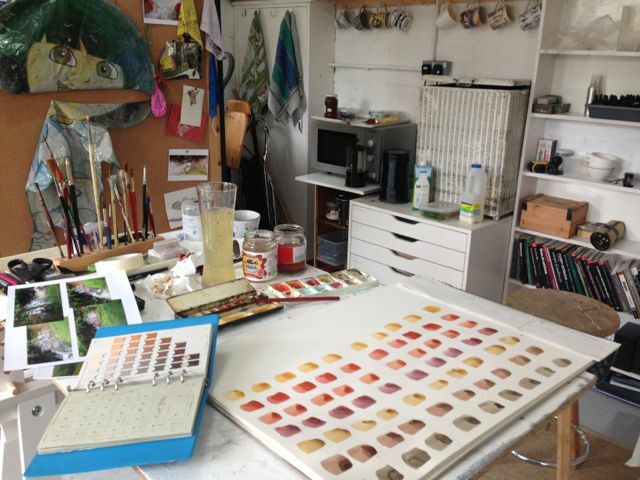 This artist-led project is also about finding ways to work across disciplines on what could be categorised as public engagement, but at heart is an exchange of ideas, values, and impressions to create a multi-layered perception of processes occurring around us.